The story of the Virgin Mary’s Presentation in the Temple comes to us not from Sacred Scripture, of course, but from some of the apocryphal Gospels. Although these are never read in the liturgy, some of what is written in them has been accepted by the Church’s tradition, both liturgical and artistic; they have given us not only today’s feast, but also influenced the depiction of Christ’s Nativity and the Assumption. It should always be born in mind that the Apocrypha (which exist in all the New Testament’s literary categories, gospels, acts, epistles and apocalypses), are not all of a piece. Some are clearly written to lend credit to one heresy or another, but others are simply harmless (or mostly harmless) tales about the Holy Family during the years of which the real Gospels say very little. 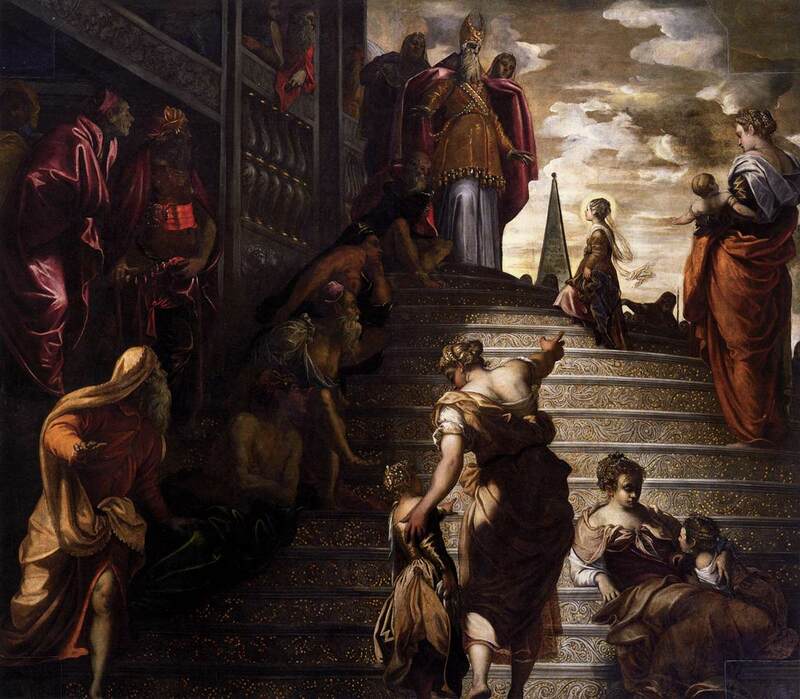 The Presentation of the Virgin, by Tintoretto, 1553-56, from the church of the Madonna dell’Orto in Venice. One of the very oldest, the mid-2nd century Proto-evangelium of James, recounts the Virgin’s presentation in the Temple as follows. This story is told in similar terms in the “History of Joseph the Carpenter”, written about the year 400, which goes on to tell how the temple priests chose Joseph to be Mary’s husband. The Gospel of Pseudo-Matthew, of the same period, adds that “Joachim, and Anna his wife, went together to the temple of the Lord to offer sacrifices to God, and placed the infant, Mary by name, in the community of virgins, in which the virgins remained day and night praising God. And when she was put down before the doors of the temple, she went up the fifteen steps so swiftly, that she did not look back at all; nor did she, as children are wont to do, seek for her parents.” (chapter 4) It then describes the Virgin’s life of prayer and work in the temple, showing Her to be a perfect model of religious life. A feast in honor of this event appears in an English manuscript known as the Canterbury Benedictional, written about 1030, and in a number of English calendars after that. It seems, however, to have died off; in the last editions of the Sarum Missal, from the mid-16th century, it is missing from the Calendar, and the Mass is included only in the appendix. Elsewhere, it appears sporadically in liturgical books printed in the century before the Council of Trent; the Mass and Office were often simply those of the Virgin’s Nativity, with the word “Nativity” changed to “Presentation” wherever it occurred. Pope Sixtus IV (1471-84), who was the Minister General of the Franciscans until two year before his election, brought his order’s traditional zeal for new Marian feasts to the Use of Rome by adding the Presentation to the Roman Missal and Breviary, as he also did for the Immaculate Conception. The unusually elaborate rhyming Office seems to refer to the novelty of the feast in the Magnificat antiphon of First Vespers. In St Pius V’s reform of the Roman liturgical books, the feast of the Presentation is suppressed, along with those of Ss Joachim and Anne, precisely because they all derive from an apocryphal gospel. This went far too strongly against the grain of traditional piety, and all three feasts were swiftly restored, St Anne’s by Pius’ own successor, Gregory XIII, in 1584, the Presentation by Sixtus V the following year, and St Joachim by Gregory XV in 1622. 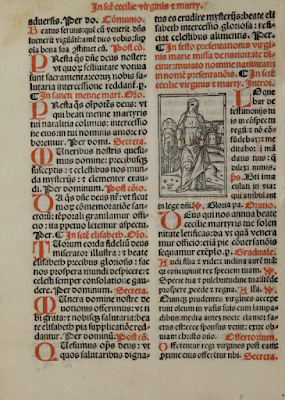 The liturgical texts of the feast are the common Mass and Office of the Virgin Mary, with proper readings only for the second nocturn of Matins, and a proper Collect. The Byzantine Rite knows no such reserve or restraint in regard to the feast, which is properly called “The Entrance of the Our All-Holy Lady, the Mother of God, into the Temple.” It is ranked as one of the Twelve Great Feasts, most of which are kept with both a Forefeast and Afterfeast, broadly the equivalent of a Vigil and Octave in the traditional Roman Rite. Afterfeasts vary in length, however, and those of the Virgin’s Presentation and Nativity are the shortest, only four days, the final day being known as the Leave-taking. As such, it has a great many proper texts to be sung in the Office, of which here I can only give a very small selection. At Vespers: Today, let us dance, O faithful, singing to the Lord in psalms and hymns and honoring His sanctified Tabernacle, the living Ark, that contained the Word Who cannot be contained; for in wondrous fashion she is offered to the Lord as a young child in the flesh, and Zachariah, the great High Priest, joyfully receives her as the dwelling place of God. Here and elsewhere, the liturgy assumes that the High Priest who received Mary into the Temple was Zachariah, the father of John Baptist. The angels beheld the entrance of the Pure One and were amazed. How has the Virgin entered into the Holy of Holies? Since she is a living Ark of God, let no profane hand touch the Theotokos. But let the lips of believers unceasingly sing to her, praising her in joy with the angel’s song: Truly, thou art more exalted than all, O pure Virgin! The Apocryphal Gospels have also helped to establish the traditional manner of representing the Entrance of the Mother of God in icons. The Gospel of Pseudo-Matthew states in chapter six that “when (Mary) was three years old, she walked with a step so mature, she spoke so perfectly, and spent her time so assiduously in the praises of God, that all were astonished at her, and wondered; and she was not reckoned a young infant, but as it were a grown-up person of thirty years old.” For this reason, She is represented in this icon, not as a child, but as a miniature adult, to indicate that the fullness of grace and virtue already resides within Her. The lamp-bearing virgins who accompany Her to the temple at Joachim’s request, as stated above in the Protoevanglium of James, are also shown. Note how The Virgin Mary approaches the high priest with Her hands open, to symbolize that She is offering Herself to God.